Some nice weather and a free Sunday meant I could finally tackle the drop-glass seals. I've been wanting to do this job for ages, but I felt it was going to be a pain as I had no idea how the glass would come out to give me access to the clips which hold the seal in - on the late GTs the glass only drops to the top of the seal meaning you have to take it out to do this job. In the end it is actually pretty easy and I did the second one in about 30 minutes. With the door card off you need to first loosen off the rear window runner (bolt at the bottom and screw at the top) and then undo the 3 nuts in the centre of the door and the 4 which hold the winder mechanism on. Make sure you support the glass while doing this as it will drop with the mechanism. Push the winder through its hole and this will allow you to move the two 'wheels' which sit in the drop-glass bottom runner's metal track. The track has a gap in the middle which helps you separate the glass and the winder mechanism. 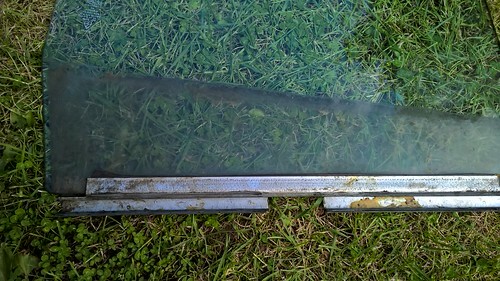 The glass and the metal track do not need to be separated for this job. With the mechanism released leave it in the door and pull the glass towards the car as you raise it up and out, this will allow the metal runner to clear the door. The seal is held on by 6 or so small metal clips. The old ones on mine were mostly rusted out and the seal was mainly held in place by the rusted metal backing of the seal attaching to the chrome rail. Once removed and cleaned up the replacement item was relatively easy to install (the clips are tight but do go on once you get the knack). My seals supplied were way too long so I ended up having to use a hacksaw to cut them down, but the result looks so much better and I think has reduced the wind noise in the cockpit.